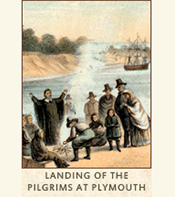 "It must be confessed that the Pilgrims possessed but few of the qualities of the modern pioneer ...They were a family and church, and were more anxious to keep together...than to explore and colonize a New World...a party of emigrants to California or Oregon, with no less work on their hands, — and more hostile Indians, — would do as much exploring the first afternoon," Cape Cod. Visit Pilgrim Memorial State Park. Explore Pilgrim Hall, the oldest continuously operating museum in the U.S.
Visit the Plymouth Public Library. 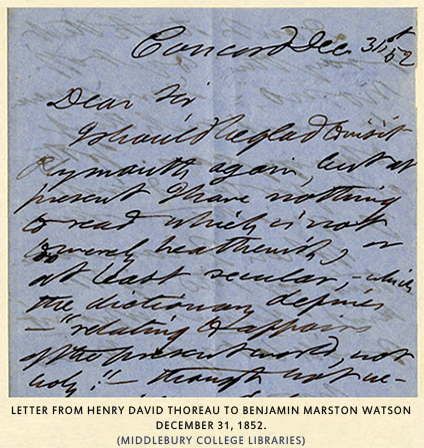 Thoreau lectured five times in Plymouth, delivering a two-part rendition of his Walden experience in February 1852, another two-part discourse on "Walking" and "The Wild" the following May, then returning in October 1854 to give a talk entitled "Moonlight." 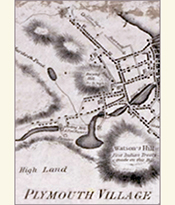 His lectures in Plymouth came at the invitation of his Harvard classmate Benjamin Marston Watson, a horticulturist who had been drawn into the Transcendentalist circle in part as an investor in George Ripley's Brook Farm Association for Industry and Education, an experiment in communal living undertaken in the 1840's in West Roxbury. With his wife Mary Russell Watson, a close friend of the Emersons, Watson instituted a lecture series at Leyden Hall that was held on Sundays to provide those who preferred not to go to church an alternative venue in which to consider "the leading social and moral questions of the day." 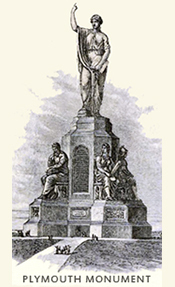 The Watsons' free-thinking approach attracted an impressive list of speakers including, along with Emerson, Wendell Phillips, William Lloyd Garrison, James Russell Lowell, Horace Greeley and other prominent regulars on what was then becoming a national lyceum circuit. TO MARSTON WATSON (AT PLYMOUTH). —I would be glad to visit Plymouth again, but at present I have nothing to read which is not severely heathenish, or at least secular,—which the dictionary defines as "relating to affairs of the present world, not holy," —though not necessarily unholy; nor have I any leisure to prepare it. My writing at present is profane, yet in a good sense, and, as it were, sacredly, I may say; for, finding the air of the temple too close, I sat outside. Don't think I say this to get off; no, no! It will not do to read such things to hungry ears. "If they ask for bread, will you give them a stone?" When I have something of the right kind, depend upon it I will let you know. 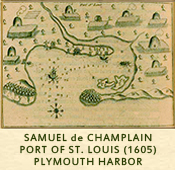 Learn more about Thoreau & Champlain. 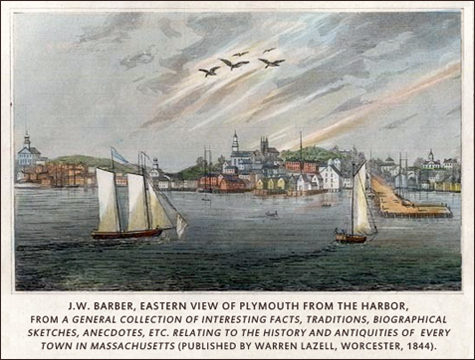 Read William T. Davis's illustrated History of the Town of Plymouth. 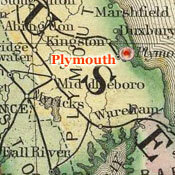 Explore historical maps of Plymouth at the Norman B. Leventhal Map Center.